And the key word here, is user. This is crucial because they’re the people who will use the software on a daily basis. There are many aspects to consider with respect to software functionality. User acceptance testing (UAT) is the last phase of the software testing process. During UAT, actual software users test the software to make sure it can handle required tasks in real-world scenarios, according to specifications. UAT is one of the final and critical software project procedures that must occur before newly developed software is rolled out to the market. User acceptance testing (UAT), otherwise known as Beta, Application, or End-User Testing, is often considered the last phase in the web development process, the one before final installation of the software on the client site, or final distribution of it. UAT is the usage of the software by people from the intended audience and recording and correcting of any defects which are discovered. It’s the closest thing to a “_real world_” test available. It gives users the chance to interact with the software and find out if everything works as it should if features have been overlooked, miscommunicated, not communicated, and so on. Who should be involved in User Acceptance testing? The most important peer group to include in UAT testing are “real” end users of your software. Every role and stakeholder group should be included which means that people from each group should be selected to join the UAT team. Now that we’ve laid the groundwork for what UAT is and why it’s essential, let’s finish up by seeing how to get started. Normally, UAT consists of four steps. But it can vary, based on whether the application is being delivered to a single customer, or whether it’s intended to be off-the-shelf software, available for purchase by anyone. Each case covers a specific usage scenario of the software. It is normally a set of actions which the user can carry out and be able to verify if the software’s worked as intended. With these in place, the tests then have to be run and the results recorded. Were the tests successful, or did defects result? Any bugs then need to be corrected and re-tested. Finally, assuming that everything is working as expected, an orderly sign-off needs to be completed. This is done more easily with an individual client, where they state that what they’ve received works as expected and meets their criteria. User Acceptance Tests might not be called User Acceptance Tests in your organizations. There are various buzzwords – such as alpha or beta testing – out there. And sometimes we also get ask about the differences between UAT and functional testing. Therefore we decided to collect all our thoughts and knowledge on the different types of UAT in this article. And that’s what, why, and how of integrating User Acceptance Testing as a standard part of your web development projects. It reduces the likelihood of issues being raised, which in turn reduces the amount of work required in development and maintenance. Sure, it’s another process which you have to manage, but the reduction in overall cost and a higher level of user satisfaction more than offsets the associated costs. 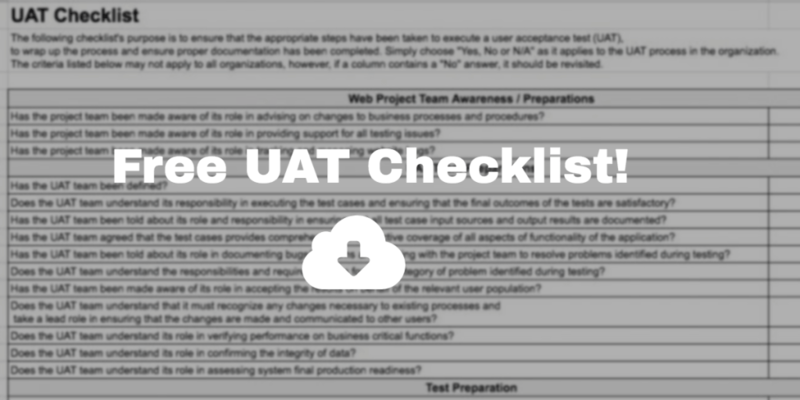 To help you out, we’ve prepared a UAT testing template which you can download. This covers everything from preparing your team, the test environment, to test execution and evaluation. Feel free to grab a copy to help you out with your UAT testing efforts. Is there a UAT tool? When considering User Acceptance Testing, you’re probably thinking of some “old fashioned” methods – like email, attachments, powerpoint presentations, spreadsheets, etc. And you’re probably wondering, “but isn’t there a tool for that?” There is. In fact, there are a few. Make sure to check out our collection of the best UAT tools in this article! If you found this post interesting, follow us on Twitter where we tweet about web development, web design, and startups. Last but not least, I wanted to give you a heads-up on Usersnap, which is our very own visual user acceptance testing solution, used by companies like Facebook, Google, and Microsoft. Start your UAT efforts with a free Usersnap trial.